HP kicked off its HP Discover conference in Barcelona this morning with announcements of a number of new business computers in its Elite portfolio, including two notebooks, two compact desktops, and a 23-inch touchscreen display. We got some early hands-on time with the new products at an embargoed press event in San Francisco last week. The EliteBook Folio 1040 G1 notebook, which will be available with fourth-generation Intel Core i5 or i7 processors, features an all-aluminum chassis that measures 0.62 inch thick and weighs 3.3 pounds. Buyers can choose between two 14-inch displays with resolution of either 1600 by 900 pixels or 1920 by 1080 pixels, and either mechanical or solid-state drives. HP's EliteBook Folio 1040 G1 will be available in both touchscreen Ultrabook and nontouch notebook configurations. All configurations of the EliteBook Folio 1040 G1 will include a backlit keyboard and Synaptics’ new ForcePad capacitive touchpad, which responds to finger pressure. HP has secured a limited-time exclusive on this new device. By varying the amount of pressure applied to the trackpad, you can control the speed of a gesture and continue the motion as you reduce the pressure. Apply more pressure as you stroke your finger down the pad to scroll through a website or document, and the scrolling speed will increase. Reduce the pressure, and the scrolling will slow. 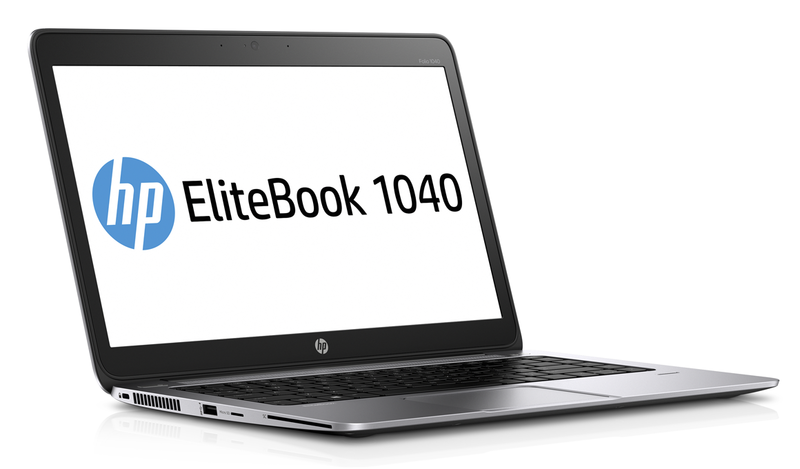 The EliteBook Folio 1040 G1 is available now at prices starting at $1299. The EliteBook Revolve's display can rotate and lay flat against the keyboard to convert from laptop to tablet. 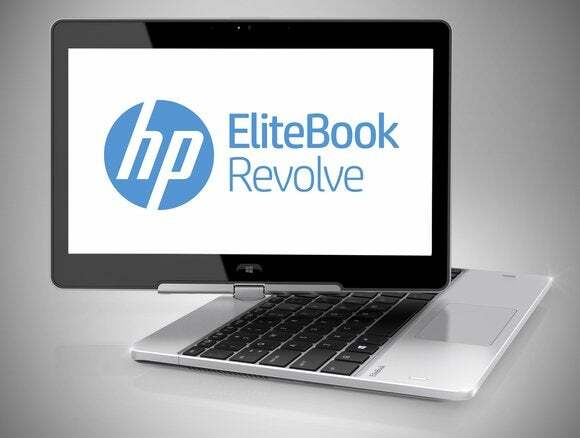 HP’s EliteBook Revolve G2 is a convertible notebook with a magnesium chassis and a display that can rotate to lay flat on top of the keyboard to transform into a tablet. It will be available in configurations with fourth-generation Intel Core i3, i5, or i7 processors, solid-state hard drives, and an optional docking station. It’s available now with prices starting at $1364. 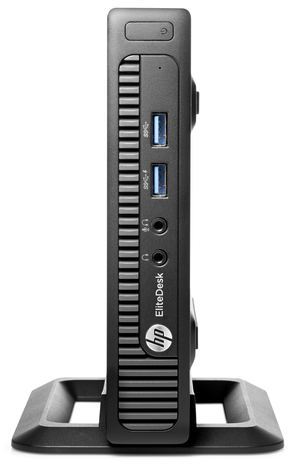 HP's diminutive EliteDesk 800 packs a lot of power for its size. HP also announced two new compact desktop PCs. The EliteDesk 800 G1 is a one-liter box that can lay flat, sit vertically in a stand, or be mounted to the back of a display or the underside of a desk using one of HP’s VESA mounting kits. It will be available with Haswell-class Core processors, with Intel vPro as an available option. The tiny PC boasts six USB 3.0 ports (two in front, four in back), two DisplayPort 1.2 outputs (with multistreaming capability), and one VGA port. The ProDesk 600 G1 Desktop Mini is about the same size and comes with such enterprise-class features as HP’s Client Security portfolio, and M.2 solid-state storage. The EliteDesk 800 G1 and the ProDesk 600 G1 are expected to be available in April 2014 at starting prices of $669 and $489 respectively. HP’s new EliteDisplay S230tm is a 23-inch display with native resolution of 1920 by 1080 pixels. It uses optical technology to recognize five touch points on an IPS panel that’s treated with an antiglare coating. The EliteDisplay S230tm can recline to 70 degrees for a tablet-like touch experience. The touch data is relayed to the host PC over an upstream USB cable. 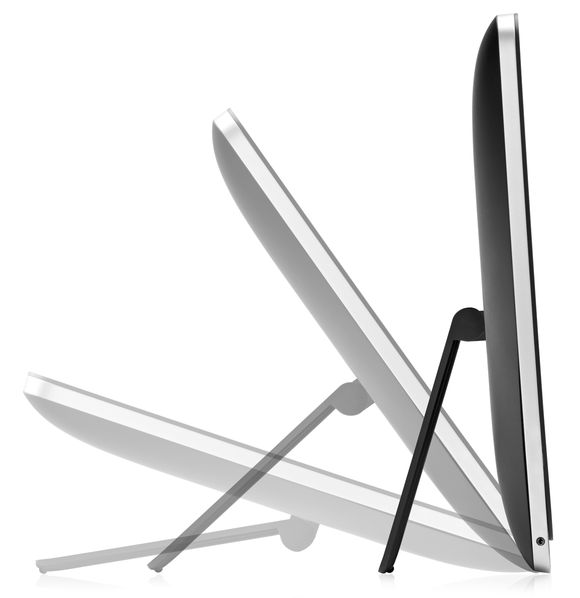 The S230tm has a spring-loaded stand that can be tilted from 15 to 70 degrees, so that it’s reclining almost flat. It can also be mounted to a VESA wall mount or an articulated arm. The display has integrated stereo speakers, dual microphones, and a 720p Web camera for video teleconferencing. HP expects the new display to be available on January 6, 2014. It will sell for $359. Update, 12/11/13: We corrected this story after HP informed us of an error in the briefing materials they provided: The HP ProDesk 600 G1 Desktop Mini does not come with Intel's vPro manageability feature.